The organ of the St. Bonifatius church in Ditfurt/Germany has been built by Ernst Röver in 1903. Röver was one of the foremost organ builders in the eastern parts of Germany of the late romantic area. More than 60 of his organs are still in existance in this area of the contry. Rövers organs are characterized by a large number of foundation stops of different tonal colors, mixtures without breaks and a sparing use of reeds. For this organ this means that about 2/3 of all stops are 16' and 8' stops providing the organist with a huge pallette of sounds. 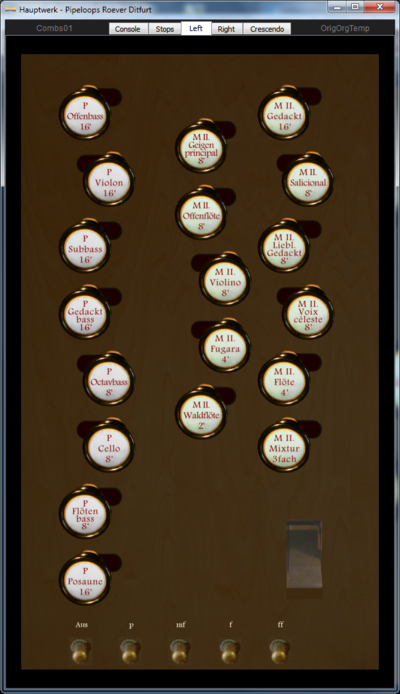 Both mixtures are straight without breaks, and the organ uses only two reeds, the Hauptwerk trumpet and the powerful Pedal Posaune. His organs are also known for exceptionally high quality, he used the best materials available and put much emphasis on good craftsmanship, making his organs work flawlessly for very long. Röver brought the pneumatic unit chest to a level of perfection that yielded a response without noticable lag, making this pneumatic action organ respond as directly as a good tracker action. The action is also operating very quietly, and, since most of the sensitive parts are protected inside the wind chest, it is working nearly maintenance free for decades. 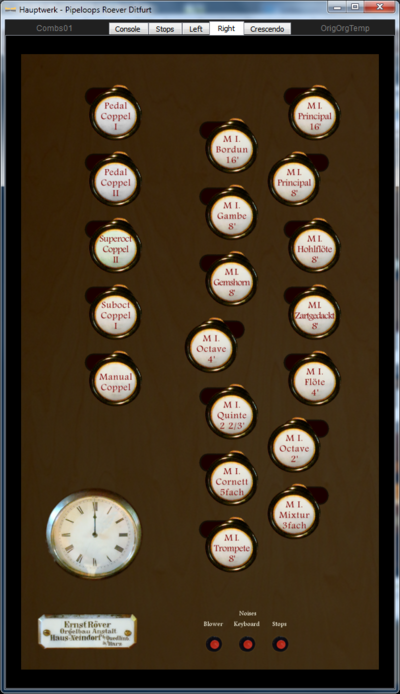 The organ has survived all modernization trends, maintaining its tonal characteristics basically unchanged. In 2006 it was restored to perfect working condition and some pipework that had been replaced by lower quality material during the wars of the past century could be replaced with new pipes made of the original material. This organ is now a premier example of the late romantic period and of the solid craftsmanship of Ernst Röver. This page will be filled with more information shortly. Meanwhile have a look at the booklet accompanying the sampleset. You can download it from here. This sample set requires a powerful Windows-PC or Apple Mac-OS computer with 64-bit operating system and the Hauptwerk™ software Basic or Advanced Edition1 (version 4.0 or higher). A powerful CPU (e.g. a modern quadcore CPU) and sufficient main memory (RAM) are essential. The memory requirements for the Hauptwerk process with the sample set loaded are specified in the table below for the most important sample loading options. Approximately 8 GB of free space is needed on the harddisc to install the sample set. 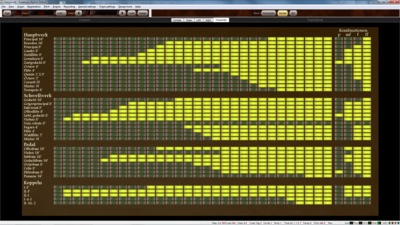 1 The Hauptwerk Basic Edition will only allow you to load the set in 16bit resolution. For best results the Advanced Edition of Hauptwerk is required. §1) This agreement defines the licensing agreement between Pipeloops Reiner Suikat and the customer of the sample set of the Röver organ in Ditfurt (Germany). The sample set consists of the samples, images, database and other files. §5) When the customer does not want to use the sample set any more, he is allowed to sell it. In this case the customer must sign a written statement that he has handed over the distribution media and all copies to the new owner and that he has deleted all files of the sample set from his computer and send this statement along with the name and address of the new owner to Pipeloops. §6) The sample set comes without any warranty. Pipeloops can not assume any liability for the use of the sample set. The customer has to take the usual precautions when evaluating the sample set, such as setting speakers to a low volume during the first tests. Here you will find sound demonstrations of this wonderful instruments shortly. Meanwhile you can listen to recordings on the Contrebombarde website. 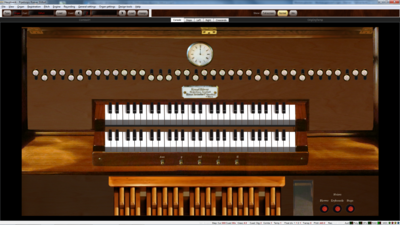 Please click on this link and select the entry "PLP - Roever Ditfurt" from the "organ" dropdown list. This is the trial version of the Ernst Röver organ in Ditfurt (Germany). 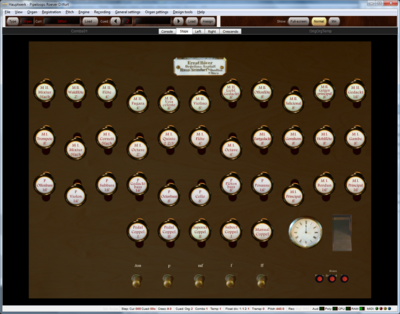 The trial version is fully functioning, but will periodically mute the sound. Please take this opportunity to try out the sample set before your purchase. Installation of the trial version is a required prerequisite before installing the full version. You can download the trial version here.